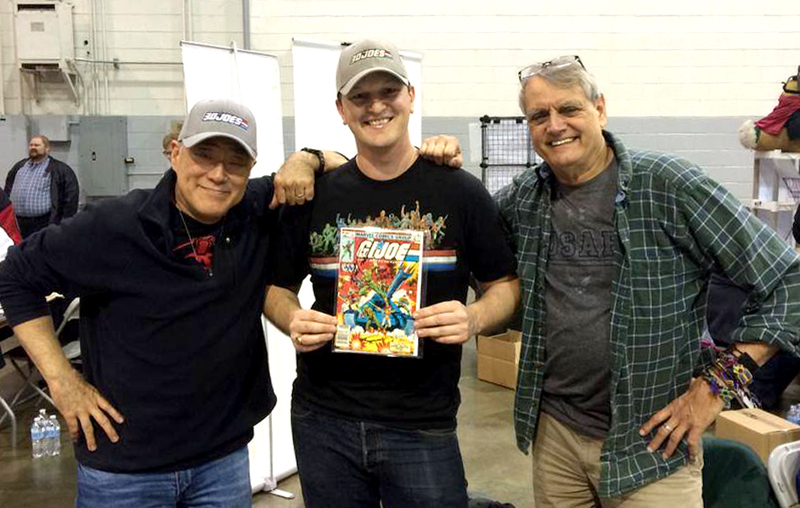 One of my all time favorite Joe memories, meeting Larry Hama and Herb Trimpe at VA Comicon! Hello, and thank you for visiting 3DJoes.com! Since you are here, you must be a die-hard Joe fan, just like me. I've met a lot of great people in this hobby over the years, and I look forward to meeting more of you. I frequent Joe Con every year, so come meet me there! A little background on me: I started collecting GI Joes back in 1985. I was only six, but the OCD was already in full force. Soon, I had a short list of Joes I was missing, four boxes full of figures, a box full of filecards and a long box full of Marvel's Joe comics (by Larry Hama). My collection checklist, dating back to 1989! I stopped collecting Joes in 1990 (I was 11 after all), and for a little under 20 years they went into storage while I got heavily into comic books, chased girls, went off to college, and started a career in video and animation. My prized G.I. Joe piece, a custom 110 figure case holding my 1983-1987 figures, most collected during childhood. ​Then, in 2008 I stumbled upon some 25th Anniversary Joes at Target, and my passion for G.I. Joes was rekindled. I dug my old Joes out, dusted them off and my collecting continued. I decided to find every loose figure I was missing from 1982-1994 and every loose vehicle from 1982-1986. I soon pushed right through those goals and I'm now working on securing and documenting all of the 1987-1994 vehicles with help from new friends. I also stumbled upon a couple of the original Joes still MOC (mint on card) at the flea market. Alas, a new collection of 1982-1994 MOC Joes was born. It was an expensive venture but it was a ton of fun. All of this carded figure collecting really helped bring 3DJoes to life. If you haven't checked out The G.I. Joe Yearbook, please do! It features every carded figure from 1982-1994 organized chronologically and it serves as a visual navigation page. Simply click the carded figure to go to that figure's page! Also check out my "Carded 3DJoes" (1982-1985) poster, featuring every single carded figure from 1982-1985, and the follow up "Carded 3DJoes" (1986-1987) poster, featuring every single carded figure from 1986-1987 as well as the two packs and three packs from 1985-1987. There are several more posters, one featuring the 1982-1983 vehicle/playset box art, one featuring the file cards from 1982-1985, and two featuring every figure from 1982-1994 all geared up and ready for action! If you've already fully explored this site, then please head on over to The 3DJoes Facebook Page and give me feedback on the site. Let me know what you'd like to see next! How can I improve the experience? Also, be sure to follow @3DJoes on twitter for updates as new content is posted! All futuristic 3D photos, old school flat photos, scans and commentary are ©2012–2018 3DJoes. Please do not steal and redistribute these on your site. They took a lot of work to make and this web site deserves the traffic as a result. This site is not sponsored or endorsed by Hasbro, Inc.
G.I. Joe, "A Real American Hero", its associated logos, COBRA, all character, group, and vehicle names and their respective likenesses are registered trademarks of Hasbro, Inc. Copyrighted works that are part of this web site are being used under the "fair use" doctrine. Section 107 of the Copyright Act provides as follows: [T]he fair use of a copyrighted work, including such use by reproduction in copies or phonorecords or by any other means specified by [Section 106 of the Copyright Act], for purposes such as criticism, comment, news reporting, teaching (including multiple copies for classroom use), scholarship, or research, is not an infringment of copyright.